The Bronx is the most dangerous place for pedestrians age 60 and older in New York City, and Bronx County has the third highest fatality rate for older pedestrians in the region, according to a study by the Tri-State Transportation Campaign. The report found that people age 60 and up throughout the region are significantly more likely to be killed by motorists while walking than are younger pedestrians. Streets are somewhat safer for older pedestrians in the region, according to the Tri-State Transportation Campaign, but they are still more likely to be killed in traffic than those under 60. The latest edition of “Older Pedestrians At Risk” [PDF] examines pedestrian fatality rates from 2009 through 2011, using data from the Census Bureau and the National Highway Traffic Safety Administration. While older pedestrians represent 18.7 percent of the region’s population, TSTC reports, they account for 33.3 percent of all pedestrian fatalities. Across the boroughs, older pedestrians suffer disproportionately from traffic violence. Of the 80 pedestrians killed in the Bronx from 2009 through 2011, 30 — or 37.5 percent — were age 60 or older, an age group that comprises 15 percent of the population. The fatality rate for pedestrians 60 and older was 4.78 per 100,000, 3.53 times that of Bronxites younger than 60. The fatality rate for Bronx pedestrians 75 and older was 3.99 per 100,000. The report does not aggregate data for all of New York City, but here’s how it breaks down for the remaining boroughs. Queens: 51 pedestrian fatalities age 60 and older, or 4.13 per 100,000, compared to 1.29 deaths per 100,000 people younger than 60 — or 3.19 times the fatality rate of younger pedestrians. The fatality rate for pedestrians 75 and older was 6.06 per 100,000. Brooklyn: 51 pedestrian fatalities age 60 and older, or 4.05 per 100,000, compared to 1.18 deaths per 100,000 people younger than 60 — or 3.43 times the fatality rate of younger pedestrians. The fatality rate for pedestrians 75 and older was 4.35 per 100,000. Manhattan: 35 pedestrian fatalities age 60 or older, or 3.87 per 100,000, compared to 1.40 deaths per 100,000 people younger than 60 — or 2.77 times the fatality rate of younger pedestrians. The fatality rate for pedestrians 75 and older was 7.42 per 100,000. Staten Island: 5 pedestrian fatalities age 60 or older, or 1.89 per 100,000, compared to 1.38 deaths per 100,000 people younger than 60 — or 1.37 times the fatality rate of younger pedestrians. The fatality rate for pedestrians 75 and older was 4.79 per 100,000. Five years ago, TSTC found that Manhattan was the most dangerous borough for older pedestrians, and the Bronx was the safest. For the region as a whole, the fatality rate for pedestrians 60 years and older is more than 2.2 times higher than for pedestrians under 60, according to TSTC, and pedestrians 75 and older have a fatality rate 2.9 times higher than for pedestrians under 60. TSTC lauds NYC DOT for making streets safer, but the report has several recommendations for NYS DOT and the state legislature. TSTC recommends NYS DOT include new provisions for pedestrians and cyclists in its infrastructure maintenance plan; hold workshops to train engineers, public works staff, and advocates on the needs of all road users; create a Safe Routes to Transit program; and expand its SafeSeniors program. These recommendations make more sense for suburban counties, where NYS DOT has jurisdiction over major surface streets. State lawmakers should create a fund dedicated to pedestrian and cycling infrastructure statewide, the report says. Enforcement issues are beyond the purview of the TSTC report, but reducing motorist speeds, and therefore reducing the number and severity of traffic crashes, is not the job of traffic engineers alone. Traffic enforcement in NYC is down overall from a few years ago, and while NYC DOT has made strides in engineering streets for safety, NYPD and the city’s district attorneys — along with Albany — must address traffic violence as the deadly epidemic it is. According to crash data compiled by Streetsblog, at least 21 NYC pedestrians and cyclists age 60 and older have been killed by motorists in 2013. 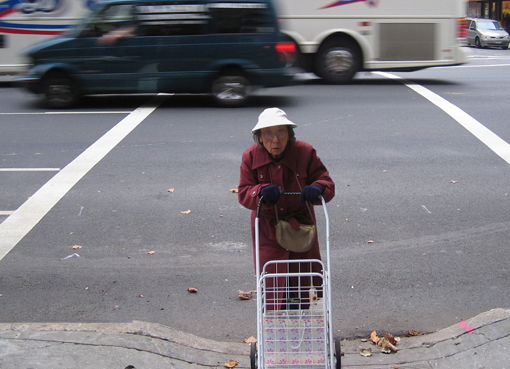 Older Pedestrians More Likely to Die in Traffic: Will New York State DOT Act?